More recent versions of Outlook have a great new feature called Quick Parts. Quick Parts are ideal if you send the same email or paragraphs of text on a regular basis and setting them up is easy! To create a Quick Part, simply start a new email and enter in the text you want to save as a Quick Part. 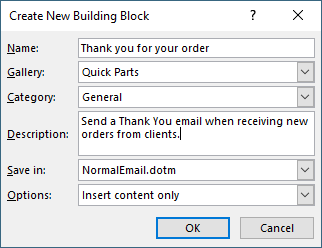 In the Create New Building Block dialog, give your Quick Part a name. This name is useful because when you type this text in your email, Outlook will prompt you to insert the Quick Part. Or alternatively, you can click on the Insert menu and then click on the Quick Part you wish to insert. You can now write intricate and detailed emails once, save them and reuse them over and over. Your new customers will be impressed at your level of professionalism and existing clients will be delighted with a consistent experience when dealing with your business. Give it a try – what have you got to lose? Posted in Outlook, Productivity, Software and tagged quick parts. ← Have you tried SimplyFile?